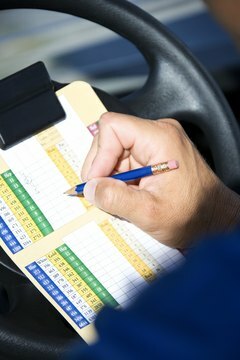 Use the information on your scorecard to figure your golf handicap. Under the United States Golf Association’s handicap system, a player’s standard handicap index is based on the 10 best rounds among the most recent 20 that he’s played. If you don’t have a handicap, however, you can receive a preliminary handicap index after playing five rounds. If you’re really in a hurry, keep the rounds short and you’ll have your handicap index in almost no time. You'll need to join a USGA-recognized golf club that offers handicap service. Play five nine-hole rounds on a course or courses with official USGA course and slope ratings, which measure a course’s difficulty. Alternately, you can play a combination of nine- and 18-hole rounds that are equivalent to five nine-hole rounds. Post the nine-hole scores with the proper course rating and slope to at your golf club, either via computer or the posting sheet, which is usually on a bulletin board near or inside the locker room. If you play an 18-hole round, report the front nine as one round – with its own course and slope rating – and the back nine as a separate round. Obtain your handicap index after the biweekly update. Convert your handicap index into a course handicap for nine holes or double your handicap index to apply it to an 18-hole round. Each course will typically post a chart in the clubhouse or near the first tee showing handicap indexes in one column and corresponding course handicaps in the other. Some courses offer a handicap conversion program in their handicap computer. Just plug in your handicap index and indicate the set of tees you will be playing. The computer will tell you what your handicap is.